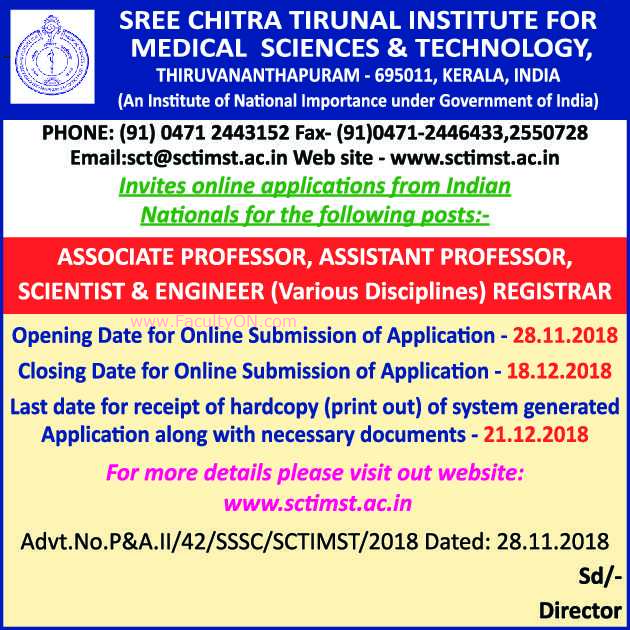 Sree Chitra Tirunal Institute for Medical Sciences and Technology, Trivandrum has advertised for recruitment of Professor / Associate Professor Plus Non-Faculty jobs vacancies. Interested and eligible job aspirants are requested to apply online on or before 18th December 2018. The hard copy must be sent on or before 21st December 2018. Check out further more details below. About College: The Sree Chitra Tirunal Institute for Medical Sciences and Technology, is one of the premier autonomous Medical schools, and an Institute of National Importance in India established in 1973 at Thiruvananthapuram, Kerala.